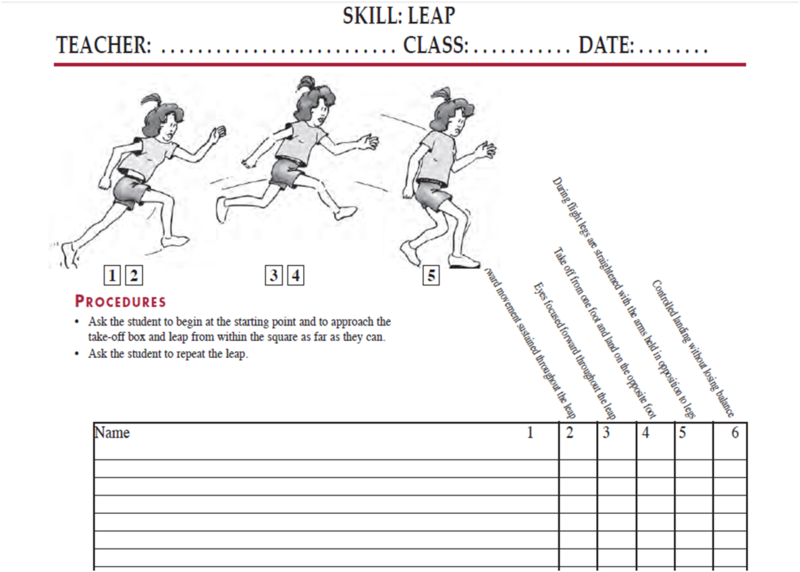 Locomotor skills such as running, jumping, hopping, galloping, rolling, leaping and dodging, horizontal jump, slide. • Catch • Kick • Run • Vertical Jump • Overhand Throw • Ball Bounce • Leap • Dodge • Punt • Forehand Strike • Two-hand Side-arm Strike. 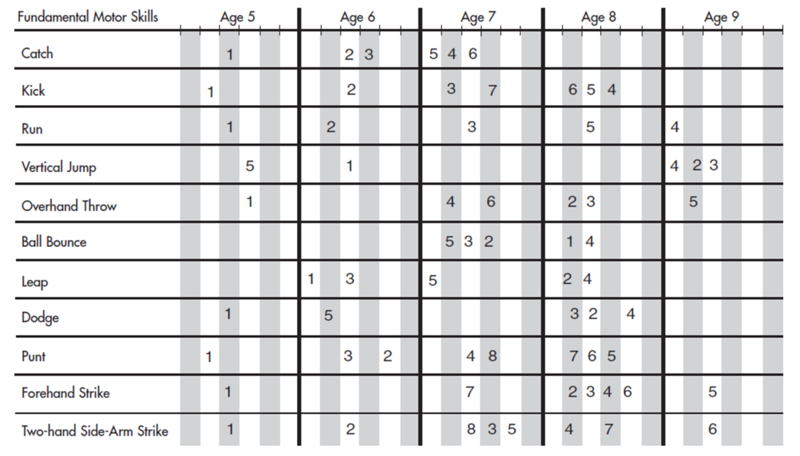 How Long Does It Take To Master Fundamental Motor Skills? 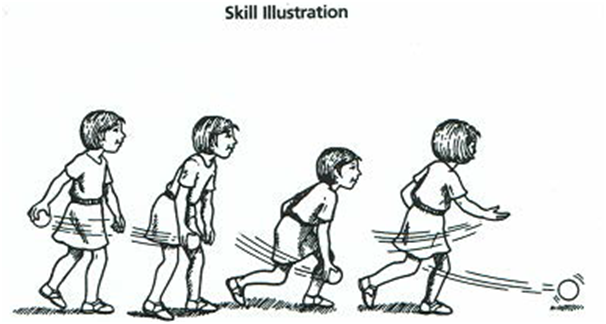 Fundamental motor skills take a long time to master. Available evidence indicates that it takes between 240 and 600 minutes of instruction to teach children to correctly perform fundamental motor skills. Don’t be put off by the length of the list! 	After a while, many strategies become a habit. 1)Above all, teach! Help children to learn a fundamental motor skill . Do not passively stand by and observe. Circulate among students when teaching. 2) Use demonstrations, words or phrases that highlight the important part on which the demonstration is focusing . Ask the student to demonstrate the skill to ensure the instructions have been understood before commencing practise. 3) student begin practice immediately after viewing a demonstration. 4) Be patient: teach one component of the skill at a time. Do not provide more than one or two pieces of new information at a time. 6) praise inpublic; remedy in private. Call attention to correct performance rather than to mistakes . 9) Keep the purpose of the lesson clear. 11) All people make mistakes. 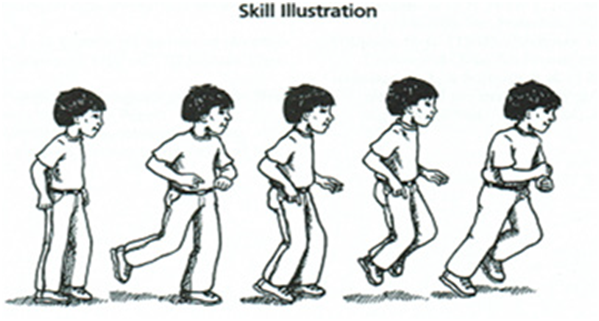 Help students to understand that learning most fundamental motor skills is difficult. No one should be ridiculed for their efforts. 12) Accept that children will be active. 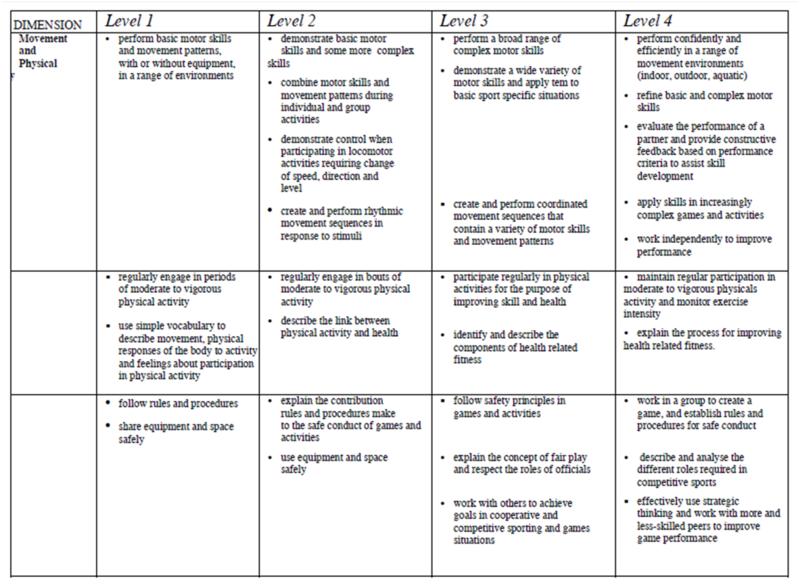 Involve children in vigorous activity early in the lesson to use up some of their energy. 13) Teach a signal for attention. Some teachers use a whistle, others a hand clap, still others their voice. 14)Set group sizes that are as small as is practical . Misbehaviour often occurs when students are forced to wait their turn. 15). 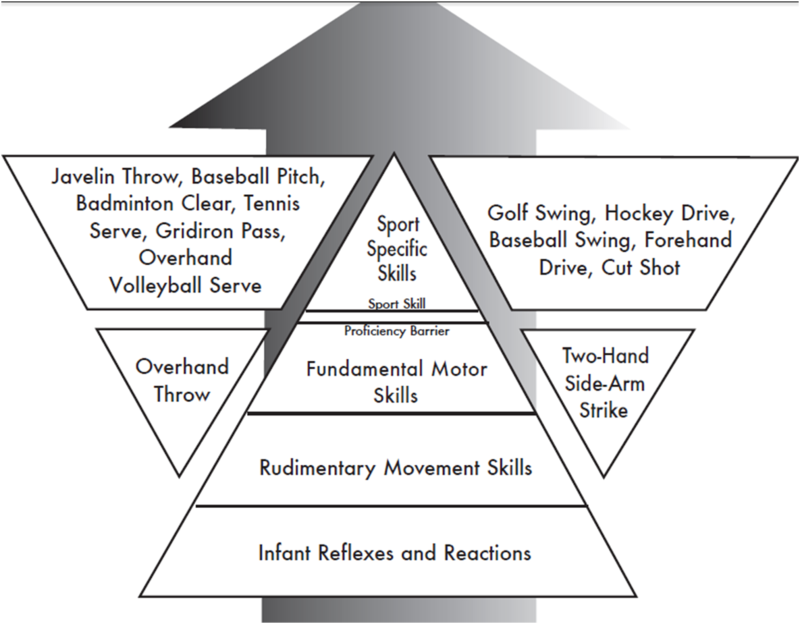 Remind students of safety considerations associated with a fundamental motor skill or game. 	From Walkley, J. & Baldock, R. (Eds.) 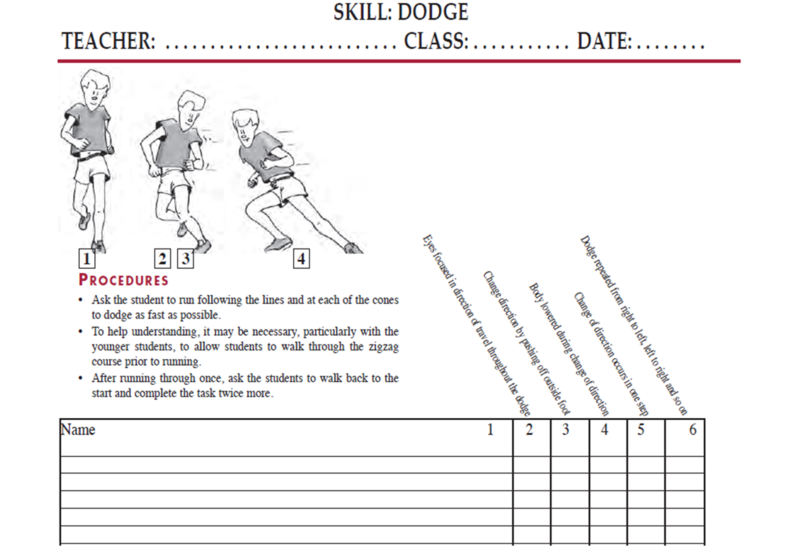 (1992) Sport It (p. 12)..
MUST to provide a 5–10 minute warm-up to prepare the appropriate muscle groups for activity. The warm-up needs to be interesting and enjoyable so that the students participate effectively and are motivated to perform well in the assessment. The examiner enters a “1” for successful completion, or a “0 “for failed attempt, for each of the performance criterion listed for the skill. There are no partial marks. If the SP refuses to do any of the tests, the examiner should check the “Did not Participate” box on the screen for that skill. Student Objective To run as fast as possible along a straight line. Facility: ▼ Measure a 25–30 metre flat straight line, e.g. basketball court sideline, denote each end with marker cones. Allow for safety margins at each end. Equipment: ▼ Have clipboard, recording sheet and pencil ready for the assessment. • Demonstrate the requirements of the run. • Ask each student in turn to run as fast as they can from one cone until they have gone past the other cone, turn and run back to the start. • Repeat the run once more. Script for Run: Run as fast as you can and stop at this cone! To jump vertically as high as possible from a standing position. Requirements "'Facility:"' ▼ Mark a cross on a flat non-slip surface. Equipment: ▼ Have clipboard, recording sheet and pencil ready for the assessment. 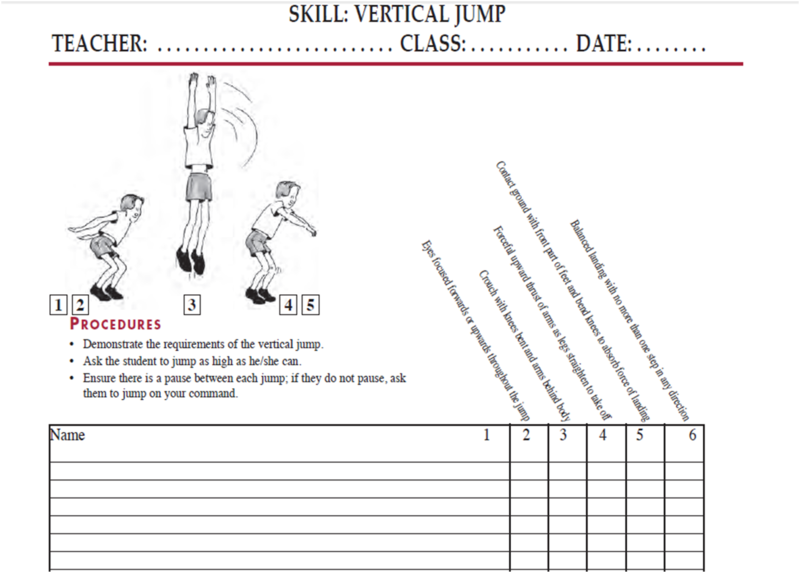 Procedures • Demonstrate the requirements of the vertical jump. • Ask the student to jump as high as he/she can. • Ensure there is a pause between each jump; if they do not pause, ask them to jump on your command. Script for Horizontal Jump: I want to see how high you can jump! One big jump! Student Objective To leap as far as possible. Facility: ▼ On a flat, non-slip surface, mark a 1 metre take-off square using marker cones to denote eachcorner. Place a mark 3 metres back from the take-off square to mark the starting point. • Ask the student to begin at the starting point and to approach the take-off box and leap from within the square as far as they can. • Ask the student to repeat the leap. Script for Leap: I want you to run up and leap over the bean bag. Watch me leap! Student Objective To move quickly through a series of cones each placed 3 metres apart in a zigzag formation. • Ask the student to run following the lines and at each of the cones to dodge as fast as possible. • To help understanding, it may be necessary, particularly with the younger students, to allow students to walk through the zigzag course prior to running. 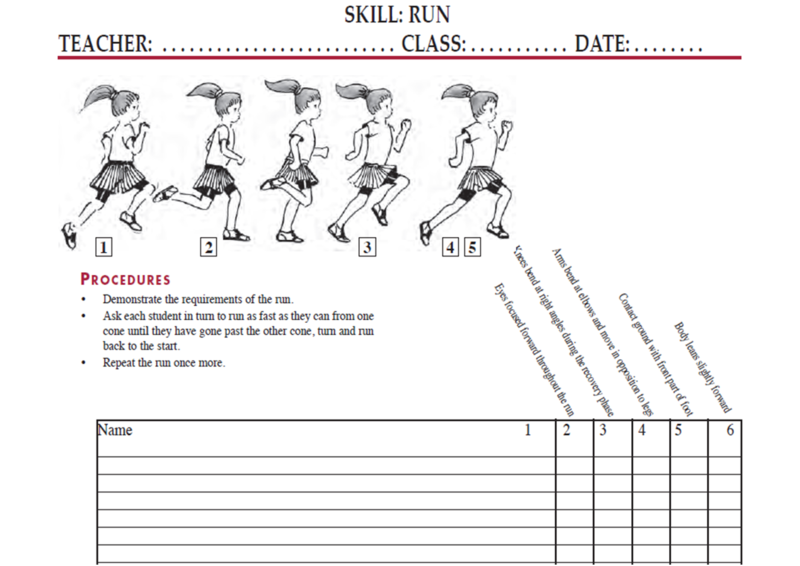 • After running through once, ask the students to walk back to the start and complete the task twice more. I am going to gallop like a horse. Watch me gallop! If SP skips instead, say: That was a great skip! Watch me gallop again. Now I want to see if you can gallop. Student Objective To catch a tennis ball thrown underarm 2–3 metres high from a distance of: 5 metres (5–7years), 10 metres (8–10 years) or 15 metres (11–12 years). Preparation Facility: ▼ Measure a 2 metre square denoted by marker cones placed at each corner. Place a mark on theback line to mark the starting position. ▼ Have clipboard, recording sheet and pencil ready for assessment. Procedures • Demonstrate the test requirements of the catch. 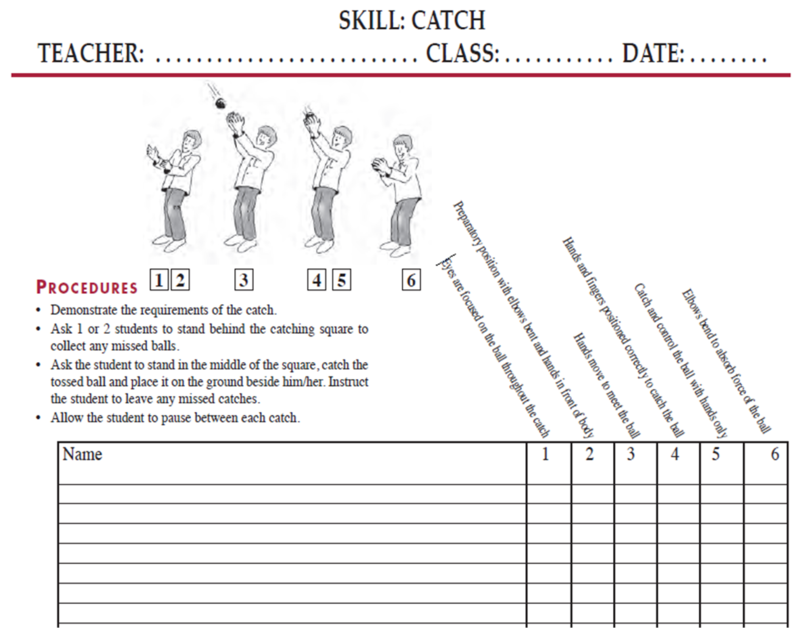 • Ask 1 or 2 students to stand behind the catching square to collect any missed balls. • Ask the student to stand in the middle of the square, catch the tossed ball and place it on the ground beside him/ her. Instruct the student to leave any missed catches. • Allow the student to pause between each catch. Watch me catch the ball. Then I am going to throw the ball to you and you are going to catch it. Student Objective To kick a stationary ball towards a target 10–20 metres away. Facility: ▼ Place a mark (cross) on a flat non-slip surface for placement of a ball to be kicked. Draw a line 3 metres back from the mark as a starting point for a student. Make sure the area allows for easy return of the kicked balls for the next student (i.e. don’t kicktowards a fenced area which divides an adjoining road). Procedures • Demonstrate the requirements of the kick. • Organise 1 or 2 students to stand 10–20 metres in front of the kicker so as to retrieve any balls kicked towards them. • Place a ball on the spot marked (a bean bag may be used to prevent a ball rolling away). 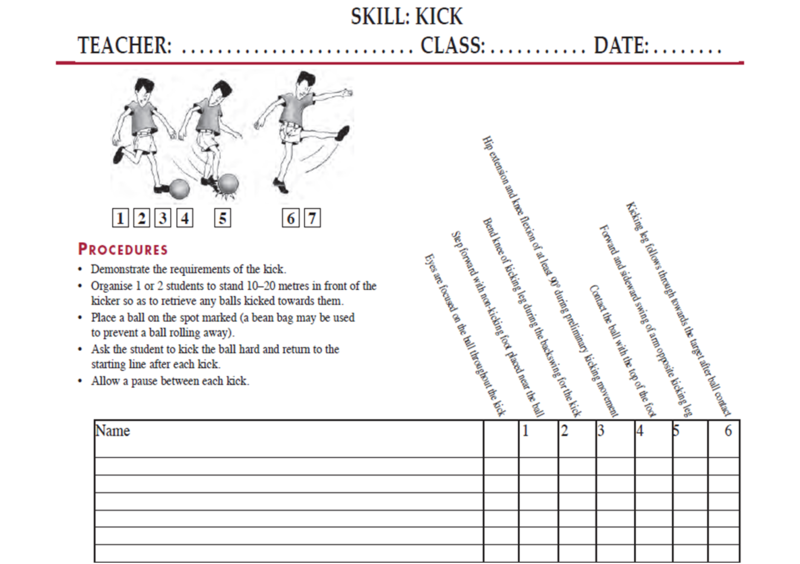 • Ask the student to kick the ball hard and return to the starting line after each kick. • Allow a pause between each kick. Watch me run up and kick the ball! Student Objective To throw a beanbag towards a target 10–20 metres away. Preparation Facility: ▼ Marked 2 metre square denoted by marker cones placed at each corner. Place a mark on the back line to mark the starting position. Place a target (i.e. cone) 10–20 metres away. Equipment: ▼ Place at least 6 beanbags next to the starting position. Have clipboard, recording sheet and pencil ready for the assessment. 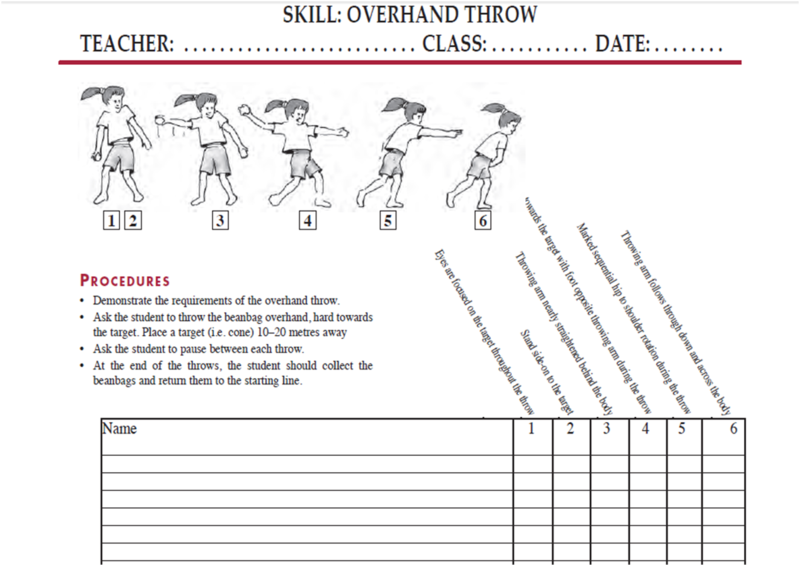 Procedures • Demonstrate the requirements of the overhand throw. • Ask the student to throw the beanbag overhand, hard towards the target. • Ask the student to pause between each throw. • At the end of the throws, the student should collect the beanbags and return them to the starting line. Script for Overhand throw: Watch me throw the ball as hard as I can. Now you throw the ball. Student Objective To bounce a regulation basketball (or 20 centimetre playground ball) at least 5 consecutive times when in a stationary position. Facilities: ▼ Place a mark on a flat hard surface. Equipment: ▼ Place a basketball next to the mark.Have clipboard, recording sheet and pencil ready for the assessment. 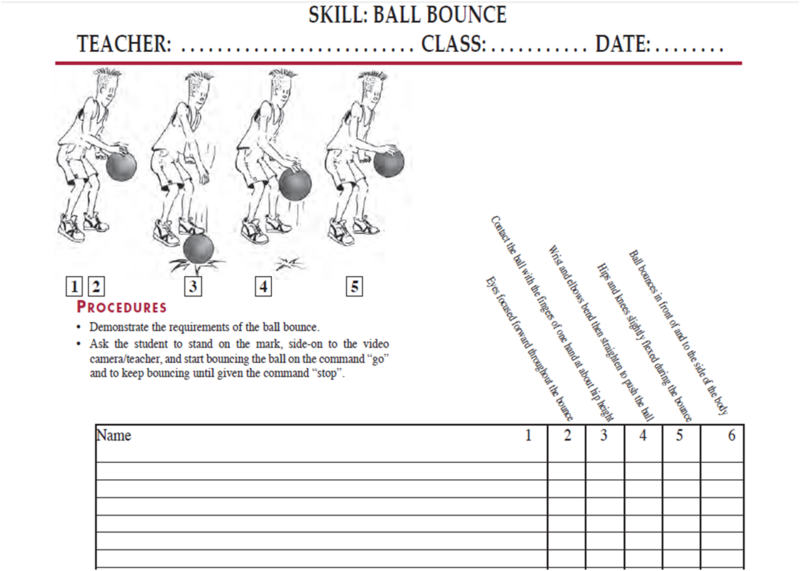 Procedures • Demonstrate the requirements of the ball bounce. • Ask the student to stand on the mark, side-on to the video camera/teacher, and start bouncing the ball on the command “go” and to keep bouncing until given the command “stop”. Script for Dribble: Bounce the ball 4 times and catch! Facility ▼ Measure a 2 metre square denoted by marker cones placed at each corner. Place a cross on the back line to mark the starting position. Mark a spot 5–10 metres from the centre of the square from which to toss a ball on the full to be struck. Instruct students to begin from the starting point, but indicate that they may move anywhere within the designated square to strike the ball. Equipment: ▼ Place the bat near the starting position and a bucket of at least six 8–10 centimetre balls next to the position from where the balls will be tossed. Have clipboard, recording sheet and pencil ready for the assessment.camera. Procedures • Demonstrate the requirements of the two-hand side-arm strike. • Throw the ball towards the student from 5–10 metres away. Only count those throws that go past the student at a height between the student’s knees and shoulders. • Ask the student to strike the ball past the person throwing the ball. • Be sure the student returns to the starting position after each strike. • Instruct the thrower to allow a pause between each strike. Script for Striking a Ball: Watch me hit the ball! Script for Underhand roll: Roll the ball between the cones!